In recent years, there have been path breaking advances in biology and medicine, which have resulted in significant increase in life expectancy and health and well-being. It is said that in this century, the advances in biology in general and Genetics in particular, will drive the developments in science and this will have significant impact on life style. The main objective of pension plan reporting in financial statements is to make sure a true picture of pension scheme is provided in the plan sponsor’s financial statements. The accounting standard boards issue accounting standards to guide and regulate reporting of pension plans. Accounting standard statements have their own objectives but the main idea is to make financial statements more transparent, consistent, easily understandable to user of accounts and represent them in a more faithful manner. A comparative study of accounting standards issued by Financial Accounting Standards Board (FASB) in USA, UK Accounting Standard Board (ASB), International Accounting Standards and by The Council of the Institute of Chartered Accountants of India is presented in this paper. Actuarial examinations are considered very difficult to pass and the pass rates generally vary from 20% - 40% but not more. Also most exam takers are also working full-time, so managing the workload and simultaneously passing the exams can pose a real challenge. Having been through the same situation, I am putting down some study tips that I hope will be useful for readers. These are based on my own personal experiences and experiences of my colleagues and friends. 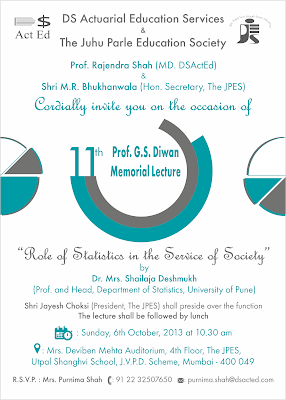 I deem it a great privilege to deliver the Seventh Professor G. S. Diwan Memorial Lecture. 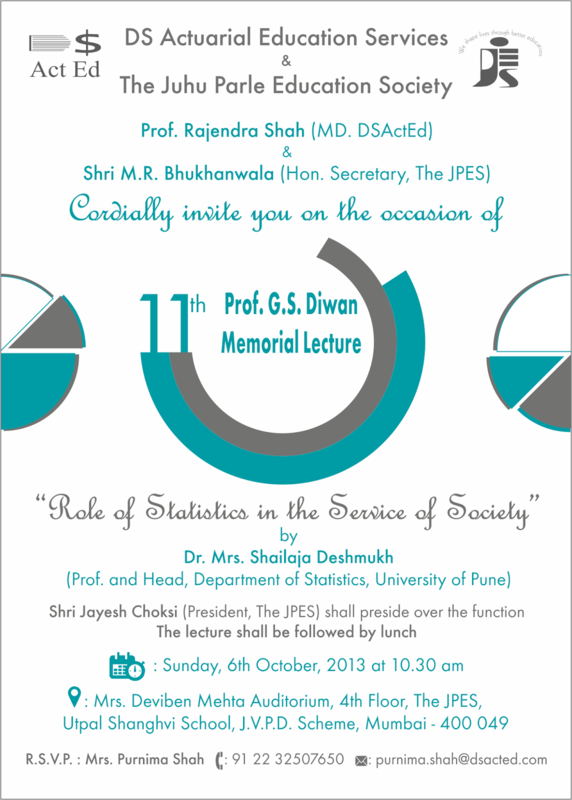 My grateful thanks to Shri M. G. Diwan for inviting me to give this lecture. Professor Diwan was a pioneer in the field of actuarial profession, and appropriately known as the father of Indian actuarial profession. He was a caring and affectionate teacher cast in the mould of traditional guru - shishya parampara. There is one dimension of his personality which has impressed me most. This aspect of his personality was highlighted by Principal G. L. Abhyankar who spoke on the occasion of presentation of Gold Medal to Professor Diwan on 7th March 1980. Prompted by the recent default of large defined benefit pension plans in the U.S.A. and the looming breakdown of the Pension Benefit Guarantee Corporation (PBGC) – the guarantor of the US pension plans, in the early part of 2005, the Bush administration proposed pension funding reforms which would make the minimum funding requirements of pension plans more stringent and in turn strengthen the pension insurance system. On July 28, 2006, these reforms were passed by a majority vote by the House of Representatives as the Pension Protection Act 2006 (hereafter referred to as PPA). It is the most comprehensive set of pension reforms since the Employee Retirement Income Security Act (ERISA) enacted in 1974. These regulations apply to the funding of single-employer and multiple-employer benefit plans and come into effect starting with the first plan year beginning after 01/01/2008. This paper is intended to give a brief description of the key provisions of the Pension Protection Act 2006 and its contrast with the old funding regulations under ERISA. A common explanation that has been put forth about the real cause of the ongoing Global Financial Crisis that started in 2008 is the subprime mortgage lending. When significant number of those borrowers failed to meet their commitments, the lenders tried a recovery through selling of these mortgaged properties leading to a slump in the property market and subsequently assuring future recoveries to log losses and so on. The problem would have had a limited impact but for bold and beautiful tool of securitization (1). Use of securitization had multiplied the money available to lend many-fold and that was the reason why liberal subprime lending had become possible. The extensive use of securitization allowed the lenders to make hay because of untested optimism and lack of appropriate disclosure requirements.